Posted byAndrew Sellon	 January 15, 2019 January 15, 2019 Leave a comment on Wonderful new fan art of Gotham’s Mr. Penn! I have been so bowled over by the kindness and generous spirit of Gotham fans. And I continue to be humbled and delighted by their talent, as well. 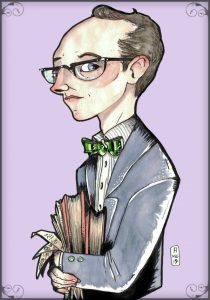 Have a look at this wonderful new rendering of my Mr. Penn character. It’s by Ana Godinho, and you can see more of her wonderful work here. I’m so tickled by this one that Ana has kindly agreed to let me use the image as a kind of logo on this website. 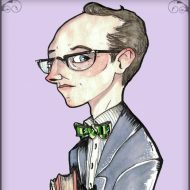 I think it captures both Mr. Penn and me! If you haven’t caught up with our current (and final) Gotham Season 5, the first two episodes are still available on Fox’s website. I’m in a few scenes of episode 501, the season premiere. And I also figure prominently in Episode 503, airing this Thursday, January 17th. It’s an intense, don’t-miss episode, trust me. And stay tuned–I will have some more terrific examples of fan art to share!